^ Canada, Government of Canada, Statistics. "Population and Dwelling Count Highlight Tables, 2016 Census". www12.statcan.gc.ca. Retrieved 2017-02-08. ^ "Dear Sir, I have great pleasure in informing you that I have at length after much trouble and difficulties, succeed[ed] in reaching the 'Youcon', or white water River, so named by the (Gwich'in) natives from the pale colour of its water. …, I have the honour to Remain Your obᵗ Servᵗ, John Bell" Hudson's Bay Company Correspondence to George Simpson from John Bell (August 1, 1845), HBC Archives, D.5/14, fos. 212-215d, also quoted in, Coates, Kenneth S. & William R. Morrison (1988). Land of the Midnight Sun: A History of the Yukon. Hurtig Publishers. p. 21. ISBN 0-88830-331-9. Retrieved 2017-10-16. ^ In Gwich'in, adjectives, such as choo [big] and gąįį [white], follow the nouns that they modify. Thus, white water is chųų gąįį [water white]. White water river is chųų gąįį han [water white river]. Peter, Katherine (1979). Dinjii Zhuh Ginjik Nagwan Tr'iłtsąįį: Gwich'in Junior Dictionary (PDF). Univ. of Alaska. pp. ii (ą, į, ų are nasalized a, i, u), xii (adjectives follow nouns), 19 (nitsii or choo [big]), 88 (ocean = chųų choo [water big]), 105 (han [river]), 142 (chųų [water]), 144 (gąįį [white]). Retrieved 2017-10-16. ^ "Life at Minus 80: The Men of Snag". The Weather Doctor. Retrieved 2014-12-19. ^ a b "National Climate Data and Information Archive". Environment Canada. Retrieved 2014-12-19. ^ "Dän nätthe dä̀tthʼi (Chief and Council)". Champagne and Aishihik First Nations. Retrieved 2016-10-31. ^ "Governance and Administration". First Nation of Nacho Nyak Dun. October 20, 2016. Retrieved 2016-10-31. ^ "Chief and Council". Kluane First Nation. Retrieved 2016-10-31. ^ "Doris Bill elected Kwanlin Dun chief". CBC News. March 20, 2014. Retrieved 2016-10-31. ^ "Liard First Nation". Kaska Dena Council. Retrieved 2016-10-31. ^ "Chief & Council". Little Salmon Carmacks First Nation. Retrieved 2016-10-31. ^ "Ross River Dena Council elects Jack Caesar as chief". CBC News. December 12, 2015. Retrieved 2016-10-31. ^ Selkirk First Nation. "The Council". Selkirk First Nation. Retrieved 2016-10-31. ^ "Chief and Council". Government of the Ta'an Kwäch'än Council. Retrieved 2016-10-31. ^ "Richard Sidney elected chief of Teslin Tlingit Council". CBC News. July 15, 2016. Retrieved 2016-10-31. ^ "Roberta Joseph new chief of Dawson's Tr'ondek Hwech'in". CBC News. October 10, 2014. Retrieved 2016-10-31. ^ "Bruce Charlie elected new chief of Vuntut Gwitchin First Nation". CBC News. May 3, 2016. Retrieved 2016-10-31. ^ "Chief & Council". White River First Nation. Retrieved 2016-10-31. ^ "Timetable, Summer 2017" (PDF). Condor Airlines. August 6, 2017. Retrieved 2017-08-06. Whitehorse is the capital and only city of Yukon, and the largest city in northern Canada. It was incorporated in 1950 and is located at kilometre 1426 on the Alaska Highway in southern Yukon. 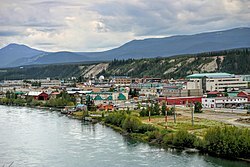 Whitehorse's downtown and Riverdale areas occupy both shores of the Yukon River, which originates in British Columbia and meets the Bering Sea in Alaska. The city was named after the White Horse Rapids for their resemblance to the mane of a white horse, near Miles Canyon, before the river was dammed. The Yukon River is a major watercourse of northwestern North America. The river's source is in British Columbia, Canada, from which it flows through the Canadian Yukon Territory. The lower half of the river lies in the U.S. state of Alaska. The river is 3,190 kilometres (1,980 mi) long and empties into the Bering Sea at the Yukon–Kuskokwim Delta. The average flow is 6,430 m3/s (227,000 ft3/s). The total drainage area is 832,700 km2 (321,500 mi2), of which 323,800 km2 (126,300 mi2) is in Canada. The total area is more than 25% larger than Texas or Alberta. Northern Canada, colloquially the North, is the vast northernmost region of Canada variously defined by geography and politics. Politically, the term refers to three territories of Canada: Yukon, Northwest Territories, and Nunavut. Similarly, the Far North may refer to the Canadian Arctic: the portion of Canada that lies north of the Arctic Circle, east of Alaska and west of Greenland. This area covers about 39 percent of Canada's total land area, but has less than 1 percent of Canada's population. The Alaska Highway was constructed during World War II for the purpose of connecting the contiguous United States to Alaska across Canada. It begins at the junction with several Canadian highways in Dawson Creek, British Columbia, and runs to Delta Junction, Alaska, via Whitehorse, Yukon. Completed in 1942 at a length of approximately 1,700 miles (2,700 km), as of 2012 it is 1,387 mi (2,232 km) long. The difference in distance is due to constant reconstruction of the highway, which has rerouted and straightened out numerous sections. The highway was opened to the public in 1948. Legendary over many decades for being a rough, challenging drive, the highway is now paved over its entire length. Its component highways are British Columbia Highway 97, Yukon Highway 1 and Alaska Route 2. Carmacks is a village in Yukon on the Yukon River along the Klondike Highway, and at the west end of the Robert Campbell Highway from Watson Lake. The population is 493. It is the home of the Little Salmon/Carmacks First Nation, a Northern Tutchone-speaking people. Yukon is in the northwestern corner of Canada and is bordered by Alaska and the Northwest Territories. The sparsely populated territory abounds with natural scenic beauty, with snowmelt lakes and perennial white-capped mountains, including many of Canada's highest mountains. 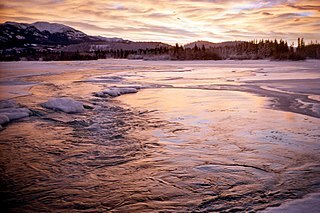 The territory's climate is Arctic in the north, subarctic in the central region, between north of Whitehorse and Old Crow, and has a humid continental climate in the far south, south of Whitehorse and in areas close to the British Columbia border. The long sunshine hours in the short summer allow a profusion of flowers and fruit to blossom. Most of the territory is boreal forest, tundra being the main vegetation zone only in the extreme north and at high elevations. Lake Laberge is an electoral district which returns a member to the Legislative Assembly of the Yukon Territory in Canada. It is one of the Yukon's eight rural districts and is named after the eponymous Lake Laberge, which is within the riding. Kluane is an electoral district which returns a member to the Legislative Assembly of the Canadian territory of Yukon. It is named after Kluane National Park, which is within the riding. It is one of the Yukon's eight rural districts. Steamboats on the Yukon River played a role in the development of Alaska and Yukon. Access to the interior of Alaska and Yukon was hindered by large mountains and distance, but the wide Yukon River provided a feasible route. 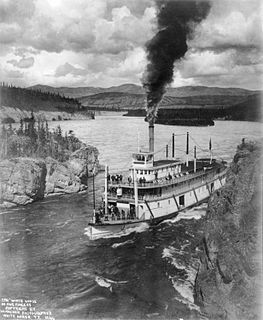 The first steamers on the lower Yukon River were work boats for the Collins Overland Telegraph in 1866 or 1867, with a small steamer called Wilder. The mouth of the Yukon River is far to the west at St. Michael and a journey from Seattle or San Francisco covered some 4,000 miles (6,400 km). Braeburn Lodge is a roadhouse on the Klondike Highway in the Yukon Territory of Canada. It is located east of Braeburn Lake and north of Braeburn Mountain, on the path of the former Dawson Overland Trail, which was built in 1902 between Whitehorse and Dawson City. The lodge itself is a tourist destination and is famous for its large cinnamon buns. Nearby Cinnamon Bun Airport is named for the lodge's cinnamon buns. Every February, Braeburn Lodge hosts a checkpoint of the long-distance Yukon Quest sled dog race. Tombstone Territorial Park is a territorial park in the Yukon, one of three territories in Canada. It is located in central Yukon, near the southern end of the Dempster Highway, stretching from the 50.5 to the 115.0 kilometer marker. The park protects over 2100 square kilometers of rugged peaks, permafrost landforms and wildlife, including sections of the Blackstone Uplands and the Ogilvie Mountains. The Park is named for Tombstone Mountain's resemblance to a grave marker.